These are some of our stylish sarees for girls of all age. They are Available in wonderful designs and trendy colors and are made by excellent craftsmanship. 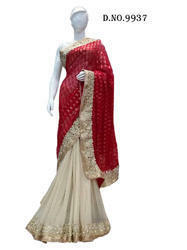 These sarees can be worn on a number of occasions and are definitely a head turners. We are a unique entity in this industry, actively engaged in offering a premium quality array of Designer Half Bhagalpuri Saree.